The Orthodox Jewish community of Berlin celebrated a Hachnasas Sefer Torah into the local shul at the beginning of the week. During the ceremony, led by Rabbi Yehuda Teichtal, Rabbi of the Jewish Community of Berlin, torches were held by children of the local Jewish community and by Syrian refugee children. “We seek to live our lives in peace” stated Rabbi Techital in his speech, referring to the endless arguments discussed as reaching the upcoming Berlin election day. “The Torah teaches us to love humanity as a whole and to always reach out to those in need”, were the opening words in Rabbi Teichtal’s speech. “Unfortunately, we have been witnessing those who try and spread out hate while taking advantage of the fear and disorder feelings of this time. This kind of manner is one far from the Jewish customs and Jewish values. We mustn’t forget that regardless of the time, and no matter what the political arguments are, we must unite as a whole and together look forward to a time of peace”. Further in his speech Rabbi Teichtal directed his words to the Syrian refugee children “It is an honor for me you joined us today and celebrated with us. G-d has brought us all to this part of the world. I wish that we all do our best to allow us all to live in love and peace together”. In spite the tension in the air of Berlin as reaching the upcoming elections on September 18th, this parade was walking to the beat of a different drummer. The festive night will remain in memory of the Jewish community of Berlin as they marched through the city streets carrying the Sefer Torah, calling out in the name of tolerance and love, freedom and hope. 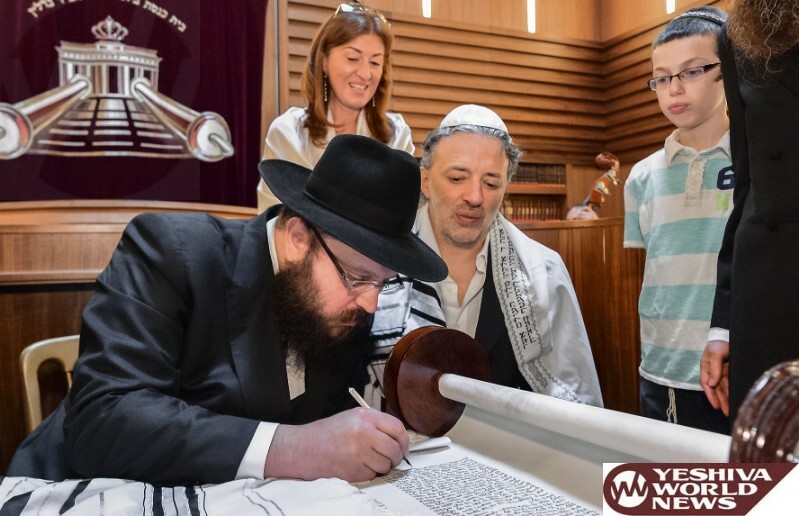 The welcoming of this 10th Sefer Torah to the community was another one of the many events held by Rabbi Teichtal’s community as he celebrates 20 years of communal work at the Jewish community of Berlin. At the parade 150 members of the Jewish community joined the march along with the honored guests, the 10 refugee children and their families. “This parade today is an alliance between God and us all to live our lives together in harmony” concluded Rabbi Teichtal.